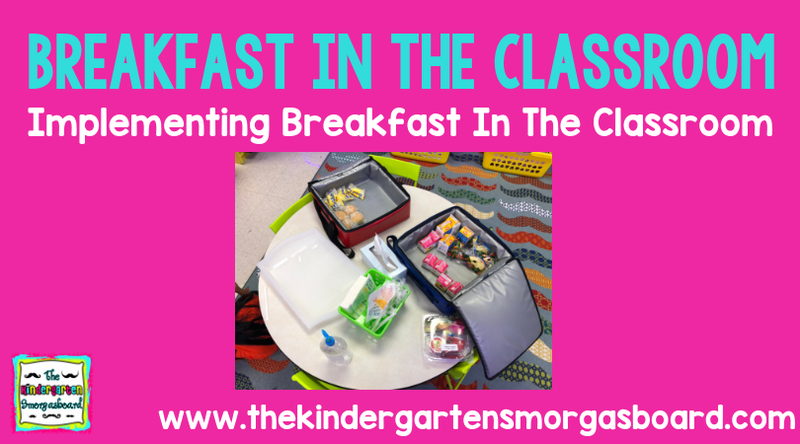 Do you have breakfast in the classroom? Does the thought of breakfast in the classroom stress you out? Have you implemented breakfast in the classroom and you’re looking for some ideas, tips and tricks? When Did You Start Breakfast In The Classroom? You know I’m all about being open and transparent. So here goes… 8 years ago our district came to the school I was working at and volun-told us that we were piloting this new breakfast in the classroom (BIC) program. My initial reaction was a big NOPE. I felt like it was another example of our district pushing more responsibility onto the classroom teacher. And I was 100% convinced the logistics would be a fail. Then there’s the mess…so needless to say, I was not a fan. And then we started breakfast in the classroom. And that all changed. Once we implemented breakfast, I was sold. What are the benefits of Breakfast In The Classroom? The first benefit is a much more calm morning time. You see, before BIC, our kids ALL ate breakfast in the cafeteria. K-4. Hundreds of kids. In the cafeteria. For 30 minutes. Allegedly being supervised. You can imagine the chaos. And the behavior issues. After breakfast they would come to the classroom all wound up. And sometimes upset if things happened in breakfast. With BIC, we eat in the classroom. It’s much more calm and peaceful and we eliminate a lot of behavior issues first thing. The next benefit is the sense of community. Now we have 30 minutes to hang out, eat, chat and do our morning work. 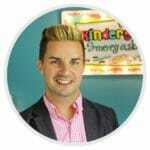 This time means I can chat with the kids and the kids can chat with each other. So many valuable things are happening: language development, friendships are forming and our classroom community is strengthened. Plus we can now make sure that everyone who wants breakfast gets fed! This is huge for so many of our kids. They can start the day with a full belly which helps them focus and can improve their behavior. How Does Breakfast In The Classroom Work? Here is how we’ve made breakfast in the classroom work for us. Set a HARD CUT OFF TIME. This is vital. Our breakfast ends at 8:00 a.m. Not 8:01. Not 8:05. 8:00. This keeps us on time and prevents us from dragging breakfast on until who knows when. Ya’ll know they would be eating at 9:30 if we let them. This procedure is communicated to parents and is a classroom expectation. If you arrive at 8:01, breakfast is over. You can’t get breakfast. However, we do keep extras along with other quick breakfast snacks like granola bars for late arrivals who want breakfast. In our classroom, we have no tables and desks so we eat on the floor. The trays keep the food off the floor and contain messes. Ya’ll. Even if you use tables and desks, USE TRAYS. This keeps the milk from going everywhere WHEN they spill the milk. Yes. Spills happen. IT’S OK! They are 5. The students get their own breakfast. They clean up their own messes. They clean their own trays. I am a firm believer in teaching kids to be independent problem solvers. Breakfast in the classroom gives them lots of opportunities to be responsible. Assign jobs so breakfast time isn’t more work for you. I have two students who bring the breakfast bags from the hallway. We have two students who return the bags at the end of breakfast. 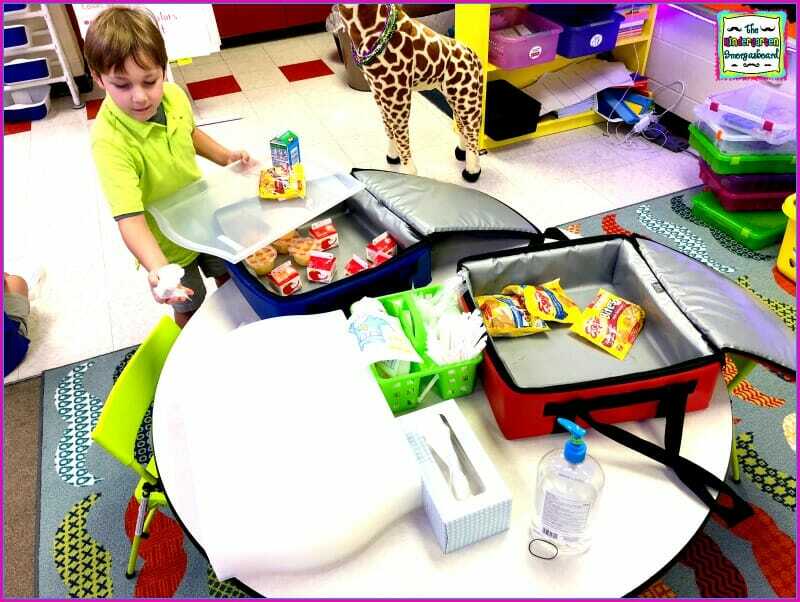 A student is responsible for putting away the trays and supply caddy. There is a student who gets the trash can from the hallway and returns the trash can after breakfast. My only job is to get our two Clorox wipes for the trays. We also have a supply caddy for straws, spoons and napkins. This keeps things organized and means I don’t have to find these materials for the kids. Hopefully this post will give you a positive view of breakfast in the classroom and the many benefits it brings for you and your students! Where did you get your trays from I can’t find any that aren’t stupid expensive. The white/clear ones are from Ikea and the others are from Amazon.